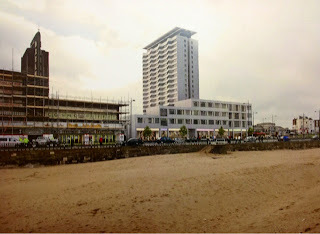 Given the BBC's somewhat exaggerated artist's impression of Margate seafront, aired on the local news with the proposed Arlington Tesco development, I thought it only right, that I share the actual impression from the inquiry and not the media's imagined image, for readers to draw their own conclusions. On a completely separate note there's more fabulous editorial hyperbole on the new TiG-alike website pictured left but if you miss it, I will add it to the existing TIG archive of increasingly bizarre political behavior. What is curious is that TIG are protesting that their web archive is somehow edited but readers will see it's not and in an event it would be self-defeating to change anything there, because it would be rather foolish of me to assume that I had the only copy of everything that Cllr Worrow and TIG have produced to date. As I'm sure that James Maskell will publish a report on his own weblog on the evening's Cabinet business, I won't steal his thunder by spending much time on it other than expressing my satisfaction, as Remembrance Sunday approaches at TDC supporting the Armed Forces Covenant, along with a number of other local Councils across the country. I did comment, that I was saddened to read that in some of our cities, poppy sellers now have to be protected from abuse or indeed violence. I reflected briefly on the importance of supporting the men and women of our armed services at a time, when they too often appear last on the list of social priorities, after leaving the Services, when I believe, they should be towards the top. At cabinet, I mentioned two men's experiences in context. The first was on a 'Rock Doc' walk in 2011, when I came across a homeless serviceman living in a cave on the beach at Broadstairs; dressed in his desert-pattern combat fatigues and with his belongings neatly folded or hung on a makeshift washing-line at the back of the cave. The other, an SAS officer, 'Dan' I've been privileged to have worked with this year, who by complete coincidence, went to school here in Thanet. The intensity of conflict in Afghanistan and Iraq has had a dramatic impact on the lives of our servicemen and in particular, the frequency of combat and constant fear of EODs. Many have been left with post-traumatic stress disorders and discharged into civilian life by a seemingly ungrateful State, unprepared and without proper resolution. If you happen to have been, like Dan,'Members of Tony Blair's Travelling Circus' then the level and frequency of counter-insurgency operations in Afghanistan, as well as the losses and casualties, have been quite remarkable and gone largely unreported by the media. The Westgate Remembrance Day parade to the Sea Road war memorial.,starts from St Saviour's church at 11:30 on Sunday and this week, I also had a call from the sister of Victor Jones, the 16-year-old, working in a shop behind the post office, who was killed by a stray shell from one of our offshore any-aircraft forts during World War II. She plans to attend in his memory. Simon the image above does show the hotel which may never get built does it not? All impressions are imagined as there is nothing there to base a real image on, just because someonbe draws a sketch of what it will look like at the beginning has no bearing on what it will look like at the end... just look at the Endcliffe hotel now apartments! Are you saying that what you show at the front of the site is what you have been told the supermarket will look like? It's the official mock-up photo of the development from the inquiry and quite different to the media's impression! Simon in this enquiry both sides are trying to make their cases, artists impressions from both sides are available. I haven’t heard that any impartial artists impressions have been commissioned by the planning inspector, who is I believe the impartial adudicator. Could you please clarify the source of what you describe as the actual artists impression. I suppose it could be produced Margate’s actual artist, it doesn’t look like the work of Turner or Emin, doesn’t seem to be in keeping with the brutalist Arlington or the deco Dreamland, does it inspire you to some sort of reaction? I hope it isn’t in a conservation area. Sorry Simon I am a bit out of my depth with this one, I can see why, in the light of recent events why one would be more likely to believe the council than the BBC, and I didn’t know the council had an artist. So are the council supporting Tesco, Freshwater or the residents? As 1oclock Rob says, the image you have published as being the supermarket is not. That image is of a possible hotel that the applicants (not tesco) accept may not get built for years. It is proposed that the huge supermarket is to be squashed into the back of the site where the desperately needed car park that the lessees are covenanted to keep open currently stands. For some reason your Council have allowed the Lessees to be in breach of that and other covenant for years. Why? The excuse offered by Iris that there was no insurance in place was a ridiculous excuse. Lets not forget that this site belongs to the people of Margate and the Council are supposed to be managing it and ensuring that the Lessees comply with their Lease conditions, not to allow the Lessees to breach the conditions in order to justify significantly increasing the value of their lease. Simon, you sound like you haven't actually been in the inquiry. I have. If you had you would know there has been repeated references to the different types of images produced by the applicant. And furthermore that the image I think you are referring to is an elevation produced by Liam where the scale is correct. While the applicants images are unverified perspectives which give an artistic impression but the scale and proportions and the relationship to the surrounding existing buildings is only indicative and cannot be verified. Liam's image has been accepted by the Inquiry as a true scale. The appellant was submitting images as late as Friday eve before this week's inquiry. They have also now submitted drawings with no hotel as they have no hotel partner. It is outline only for the frontage. So perhaps this post of yours is a bit of an own goal. If you can find out what exactly is proposed you're doing better than any of is in the Inquiry all day every day. The architects have admitted much is still undecided. This is after 10 years of involvement. We may be getting distracted here. What we have ere is the applicants supporting artist's impression for the inquiry, as displayed alongside the plans on the top table of the inquiry. I do hope that helps. I thought it might be useful for the public to see it. What you make of it and whether you agree or disagree with its projection is up to you and you are free to debate the mater here. Simon you have displayed a picture that has absolutely no reference or connection to the superstore application. You might as well have shown a picture of the clocktower. If you want to show what this monstrous proposal is really like and be even handed, will you also put up the to scale drawing which has been accepted by the inspector as correct please. If you wish to send me something different to that which sits in the Council Chamber alongside the developer's plans, feel free! Simon now you have clarified that this is an artist’s impression commissioned by Tesco’s and submitted to the council in support of their application, I think I can see what it represents. I think the front bit is actually a pile of portacabins that will be used by the construction workers, I think the BBC have assumed that after construction work these will be removed revealing the backside of the supermarket. Perhaps Louise can also give us her views on the traffic chaos and impact on local stores created by the Tesco in Westbrook? After all, she supports it by shopping regularly there, at least according to today's Gazette. Whatever the perspective or artist's impressions are Margate Seafront (or close by) is no place for a large supermarket. The top of Margate High Street maybe better which would move the footfall to where it is required. The problem we have is of large powerful corporations and their bully boy tactics. Many local people remember the controversies surrounding the original construction and plans for Arlington House. The fact that money talks is no reason to kowtow to large corporations. Thanet council be brave and make sure that development of this area is in keeping with the regeneration of our town as a seaside resort. Tesco is not!! Of course they show the nice pretty picture to the Council Simon, they aren't going to show Liam's to scale image that shows what they can build given permission with parties interested. No body, no company, no partner has expressed an interest in building a hotel at the front and similarly no-one has expressed an interest in running shops in the retail spaces that "may also" get built. If the permission then is to build Tesco, modernise the tower block and also build the hotel and retail stores then, given ZERO INTEREST from anybody we can expect the hotel and retail units to be empty once building work has finished and eventually, given Freshwaters history, will eventually fall into disrepair! I think your posting of the picture Simon is somewhat disingenuous. Disingenuous? Certainly not. It is what it is and I'm simply sharing the information in contrast with the completely exaggerated impression of the Tesco freely distributed to the media which looks like a complete monstrosity and is larger than the now defunct and deceased gorilla which occupied the wall of the night club several door along. Simon as Louise pointed out the image of the "shed" was to scale and has been accepted as such. Without the shops and the hotel being built what he shows is exactly what the population would see when standing on the main sands. Oh dear, outsiders, regardless of how much investment and energy they have brought to the area, are vilified by the incumbents for shopping in the nearest superstore. Perhaps if thanet council had not killed shopping in margate and broad stairs by allowing Westwood, there would not be any traffic there. Presumably if / when Tesco gets built then Louise and all the other NIMBYs will be driving past it to use the Westbrook mini Tesco with less choice and fewer bargains. Let's be frank for the uniformed! Thanet Council didn't "Kill" anything by "allowing" Westwood X. Local people wanted and are delighted with a much wider choice of shopping. Margate High Street is quite inadequate for the 21st population of the island and shopping malls have devastated noncompetitive high streets across the land which had little to offer but the same bland choice of cloned stores, Woolworth, Next, M&S etc etc. Correct me if I'm wrong, but don't shopping malls also offer the same bland choice as other shopping malls? Certainly I don't see many independent stores at Westwood Cross. Interesting that more than half of Simon's post was about our armed forces and remembrance, but the great and good of Thanet blogging concentrate entirely on an artists impression of a proposed building. Says much for local priorities and remembering ongoing sacrifice. No doubt come Sunday a dwindling gathering of old men with medals supported by some young cadets and scouts will gather round our local memorials, but most of Thanet's population will not even notice what day it is. Personally, I find that of greater concern than which artists impression Simon used in his article. Simon is correct on his last point, TDC didn't kill the High Street, WE THE PEOPLE DID! I made a prediction to my missus the other day and that is that even the out of store super malls will be gone within 20-30 years replaced with massive distribution centres that only employ people to collect the items that you email, text, post on a website and then deliver to you in a few hours. Before long a generation of kids who have lived and breathed the internet for their whole existance will be the majority shopper and they embrace technology and that technology will be the death of shopping as we currebtly know it. Yes you will be able to shop local, but for actual personal service you will be paying a premium and it will be up to the individual to decide whether the price at the till is worth it. Perhaps Louise can also give us her views on the traffic chaos and impact on local stores created by the Tesco in Westbrook? After all, she supports it by shopping regularly there, at least according to today's Gazette." I believe Tom wrote the piece about me having Tesco shopping bags this week as I returned home from a crack of dawn walk with my dogs before cooking guests breakfasts and heading off to the Inquiry. I bought some dog food from the Cliftonville Tesco Metro. Not that I'm saying I haven't parked in a correct parking space at Tesco at Westbrook at a similarly early hour. I do. I have never said I was against a Tesco at the Arlington site. I think a smaller store, similar to the Metro size store at Northdown rd would be better. But that isn't what was proposed. But I would like to add that we raised substantial concern re the ongoing detrimental effect of the dangerous parking at the Westbrook Tesco site as well as the effect on the shops at Westbrook. It was of course not within the original papers when the Arlington application came to Planning Committee and has only later been added to the appellant's Retail Impact Assessment.